"El colgante es precioso y esta muy bien de precio.gracias"
price: (Retail)	39,93 € tax incl. This particular veronese green agate geode with greyish veins has the characteristic properties of agate stones and an exceptional shine. This piece has a small central cavity where small crystals appear. 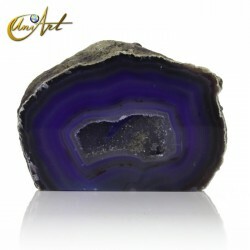 Agate is considered the stone of Prosperity, as it attracts wealth and drives away the evil eye.